I miss the Boutique experience!While I am A trained designer my roots lie in the bespoke custom design sector… It’s my passion. It’s the passion of many who travel across state-lines, borders and oceans from to get that dress Fashion Tourism! This year along with some partners we aim to bring that sector online! I am a third generation custom bespoke designer. Across the world women head “Back Home’ or to special designer adept in servicing the needs of their culture and body types! It has been a social commerce platform way before Social media was adapted! As of December 2011 I retired my exploration to take on the challenge of creating a solution! 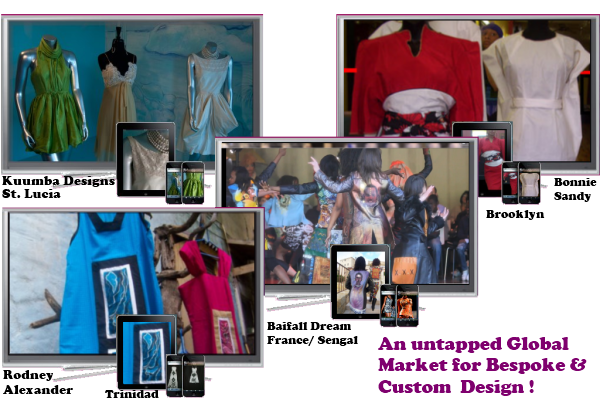 The Bespoke custom design market across the globe is untapped as far as the technological growth and advancement goes! Few even knows it exist and the numbers are extremely under reported! I had already written this post when I decided to add a response to an Elevator Pitch on BOF! the concept seems sound given that it is India and production is strong … what is missing though is the fact that many travel for a specific purpose… we want to fit our garment and ensure It’s JUST RIGHT! We have experience in This Brooklyn Serves as a Local global center with traveler across the US coming to Brooklyn to be fitted by a native from their country or a local designer living in NY! Still though each designe,r each store has a vibe that’s half the fun! There is so Much to cover. Fashion technology is not retail technology! Retail Solutions do not serve (all the needs of a ) fashion businesses! Granted all businesses eventually have to trade so retail eventually becomes a factor! Almost All garments are made by hand… and DIY is simply survival in many societies! As for “one off” and “Bespoke”, they’re simply the norm for my mom and others in her circle! I am A 3rd generation Bespoke Custom Dressmaker, I’m also a trained fashion designer … and have been flying the fashion Banner in NY Tech scene for the last 7 years. Still sometimes i have to sit back and think things through! Posted in Latest and tagged Boutique Solutions, Tech Evangelism.